The Libraries Taskforce held its fifth meeting on 19 November and our hosts were Newcastle libraries. We met on a sunny day which showed the central library off to perfection, as it is a new building with walls of glass which let light flood into the central atrium and open plan floors. Representatives of the library gave us a whistle stop tour, with a pause for questions in the popular Business and IP centre - run in partnership with the British Library. 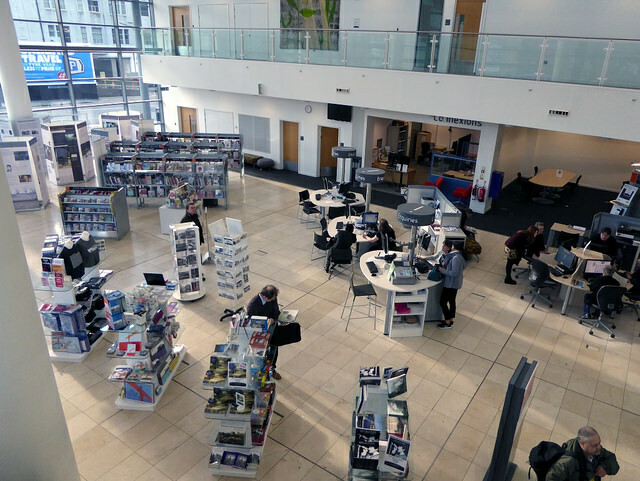 We also had the opportunity to meet representatives from different parts of the library services team, including their digital engagement lead and their publishing arm, and people from the different organisations across the city who have gone into partnership with various libraries to run community service points. The Taskforce thanked Newcastle City Council for the tour. We had been particularly impressed with the Business & IP Centre and results to date. We discussed and supported the first draft of the guidance / good practice toolkit. We agreed to work collectively on co-ordinated communication plans including for National Libraries Day on 6 February 2016 and in finalising the positive narrative for libraries. We confirmed discussions will be on the agenda at the next Taskforce meeting on the implications of Spending Round outcomes. Full minutes are available here. We took the opportunity of being in the northeast to visit several libraries. Our next post will describe what we saw, and report on the opening of the new Stafford library.